Don’t tell me you don’t know Freepik. We have had them on our and therefore your radar quite frequently already. Just check out the articles under “Related Links” below this post. It is merely two months ago, that we were able to share another exclusive with you, Freepik’s Flat Icon Set with 200 pictograms. Today’s 250 icons are very special and don’t represent the average icon bundle in any way. The 7,9 mb heavy download package in ZIP format contains all icons as PNGs in three different sizes. You’ll find PNGs with full transparency in 32, 64 and 128 pixels squared. In addition to that, you’ll also find the raw design files in not only AI and EPS, but also in PSD and SVG formats. These are completely unrestricted, you’ll only have to ungroup some of the vectors in Adobe Illustrator to be able to play around with the full source. Create to where your creativity leads you. Most obviously you are able to make the icons available in any size you need that way. 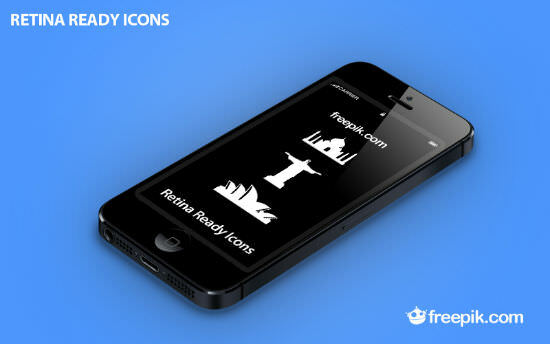 Our 250 monuments pack represents famous buildings and places from around the world. There are not only the usual suspects such as the Statue of Liberty or the White House. 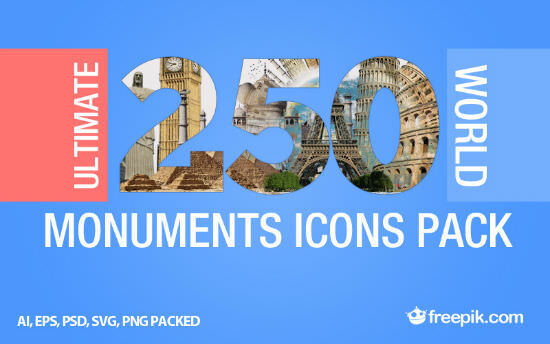 Freepik literally roamed the world to bring you monuments from Indonesia, China, Europe, South Africa, India, Russia or Japan – just to name a few. This pack is a must-have for any backpacker or other globe-trotter out there, not to speak of those designers on international missions. The licensing will not surprise you. You are allowed to use the icons for private and commercial purposes alike. You are not allowed to redistribute the set from third-party websites. And you are not allowed to claim copyright or even imply you are the creator. But that should be simple rules of fair play and as such self-evident. Using JPEG for the poster is a bad choice. The compression is destroying the image quality. You get all the above-mentioned formats, so the JPG should not be too much of a turn-off. Great offer :) Thanks for sharing!